In a wide-ranging interview with RTÉ, the Taoiseach also said that he was “not in the business of providing abortion on demand” and said the Anglo promissory note would be restructured. TAOISEACH ENDA KENNY has said that the possibility of cuts to public sector pay cannot be ruled out if negotiations on a successor to the Croke Park Agreement with trade unions fail. He also said that the issue of increments paid to some public sector workers are on the table as negotiations, which got under way this week, continue in the coming days. Kenny said that the government had committed to making €1 billion in savings in the public sector by 2015 and said that pay accounted for a third of that figure. “We want to achieve those savings by agreement and consent where that’s possible and I hope that can be achieved,” Kenny told RTÉ’s The Week in Politics. But he said that the government “reserved the right to legislate for reductions in pay where agreement can’t be reached” and said that the €200 million in increments were on the table. He also did not rule out a process of benchmarking in the future but “not in the way it was done before”. Kenny said that he hoped that current “intensive negotiations” between trade union leaders and the Public Expenditure and Reform Minister Brendan Howlin would see an agreement reached. Two years after the collapse of the last government, Kenny defended his own administration’s record so far and pointed out that in the three years prior to this government taking office 250,000 jobs had been lost in the private sector. He said that under the previous government the country was “haemorrhaging jobs all over the place” and said that lower and middle income families have been protected by his government’s policies. “We’ve beaten adversity before, we are making very steady progress here. You’ve not heard me speaking of green shoots of recovery or everything is rosy in the garden,” he said. Kenny told the programme that he was confident that the “patently unfair” situation with the Anglo Irish Bank promissory note would be dealt with and the deal – which sees Ireland paying €3.06 billion every year for the next ten years – would be “restructured and re-engineered”. He said he foresaw the deal as being restructured “from a serious overdraft to a long-term, low-interest mortgage”. On the issue of abortion and yesterday’s pro-life vigil in Dublin, Kenny said that he was “not in the business of liberalising abortion”. The Taoiseach said the government had a “duty and responsibility” to bring clarity to the legal situation on when an abortion is permissible in Ireland and insisted that the law would be strict and narrow. “It is strictly, very strictly on the narrow line of what our constitution means, voted on by the people,” he said. He said it was important that the issue was treated with sensitivity and insisted that it would not lead to a liberal abortion regime in Ireland. In numbers: How much would we save by abolishing the Seanad? Email “Public sector pay cuts not ruled out, increments on the table - Taoiseach ”. 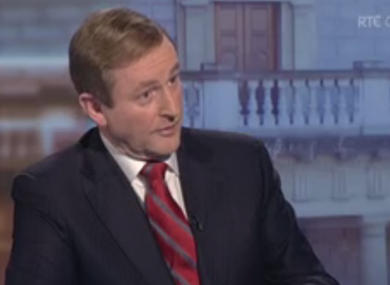 Feedback on “Public sector pay cuts not ruled out, increments on the table - Taoiseach ”.